Now it is easy to transfer EPF online using EPF Unified Portal. 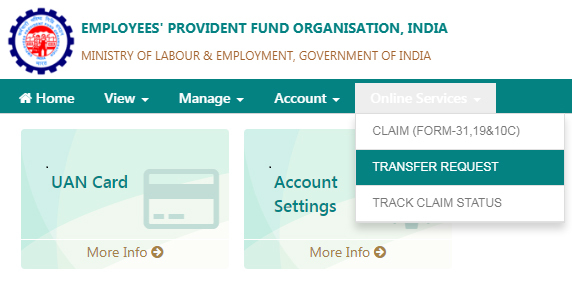 A Unified portal provides facility to transfer EPF online. The earlier option of using Online Transfer Claim portal is not available anymore. The new facility is launched on EPF unified portal. In this post, we will understand how to transfer EPF online using EPF unified portal. This facility will be used to transfer EPF online from the previous employer to present employer. When you change your job, you have two options either to withdraw your EPF amount or to transfer it to a new employer. In case you want to transfer your EPF to your new employer you have two options, you can transfer EPF offline or online. Online Transfer of EPF is preferable as it is easy and quick. Who can transfer EPF Online using EPF Unified Portal? The prerequisites to transfer EPF Online using unified portal are given below. Your KYC must be complete. Your Aadhaar Card, Bank account, Bank IFSC details should be seeded against your UAN in unified portal. Aadhaar is not mandatory for submitting online PF transfer request. The date of Joining and Date of Exit with Reason of Exit of the member in the previous establishment should be available on Unified Portal. How to Transfer EPF Online using Unified Member Portal? The step by step guide to transfer EPF online using Unified Member Portal is given below. Visit Unified Member Portal and Login using your UAN ID and Password. On the top menu bar, you will find Online Services. Click on Transfer Request tab provided under Online Services menu. You will be able to see Personal Information and Details of the present account of which transfer will be affected. You need to provide details of your previous EPF account. You have the option to submit online claim form attestation by the present or previous employer based on availability of Digital Signature for authorization. You need to provide your old UAN or Member ID. In case your member format is old you can generate Member ID in required format by Get MID option. In next step, you need to click on “Get OTP” to proceed with authentication of online transfer claim. OTP will be sent to UAN registered mobile number only. On receipt of OTP, enter OTP and click on submit button. Once you submit the request you are required to submit the signed copy of the transfer claim PDF to the selected employer within a period of 10 days. Now employers have to digitally approve the transfer requests submitted by you in the unified member portal interface Online Services >> Transfer Claims menu online using Digital Signature. In case of further assistance about transferring EPF online, you can dial toll-free number 1800118005.
i have just switch company, my erlier PF was maintain by EFO govt office but now my new company PF is maintain by my company trust, in this case my PF will transfer or not? please suggest and guide me if possible then how ? EPF account will be transferred in your case. As it will be UAN based account,it will be transferred automatically.Your new company will provide you one form for filling that will transfer your EPF account.